Gracias a todos los que se presentaron ayer en los entrenamientos abiertos, muy contento por el apoyo brindado de las personas que de verdad me quieren, muchas gracias Dios los bendiga! Créditos : . @desautomatas #follow gracias por el excelente contenido hermano! I thought I misunderstood Yair Rodriguez when he said he was excited about cutting weight for his Saturday main event against “The Korean Zombie,” Chan Sung Jung, but when I asked him to repeat his response, he doubled down. That’s the sign of a man happy to be fighting again, and that’s exactly where the 26-year-old is heading to this weekend’s bout, his first since a May 2017 loss to Frankie Edgar, his first as a member of the UFC roster. Before that matchup with the former lightweight champion, Rodriguez was 6-0 in the Octagon, a TUF Latin America winner, and the next big thing in the sport, not just in the U.S., but in his native America and throughout the world. After that fight, things got sidetracked, most notably when he was released by the promotion and then was re-signed. Injuries kept him sidelined as well, but he tried to make the best of the situation over the last 18 months. Ironically, it was an injury to Edgar that opened the door for Rodriguez to return, and he jumped at the opportunity. “I said before in interviews that I would like to fight The Korean Zombie,” Rodriguez said. “He is one of the guys that I look up to because he’s been in the game longer than me and I’ve seen him fight Jose Aldo and other fighters that I respect a lot, and I know why they call him The Korean Zombie because he’s always coming forward and he’s aggressive and he never quits. And he will get that gut check kind of fight from the South Korean action here. So how does one stop a zombie? 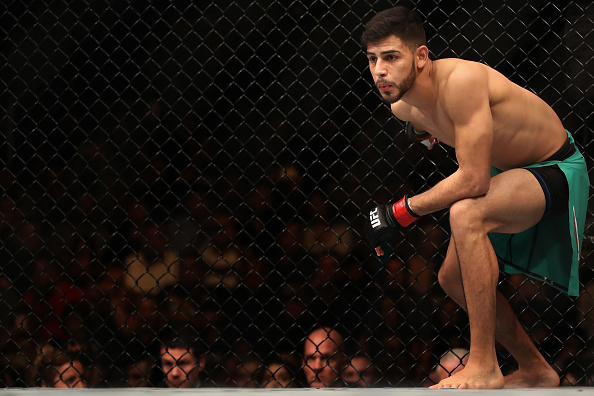 At 26 years old and with a fresh start in the UFC’s featherweight division, Rodriguez’ excitement sounds genuine, and it’s good to see him back because he still has that talent to be a game changer in the sport. Does that mean the pressure’s back on his shoulders? Not in his eyes.